The messaging app that you should be using is Whatsapp. Drop the other messaging apps that you have been using, and switch to Whatsapp. Urge your messaging pals to migrate to Whatsapp. Why? Because it uses end-to-end encryption and Perfect Forward Secrecy. I will explain why this is so important. Today I gave a presentation on Restoration of Priority. This was at the AIPLA meeting in Minneapolis. Here was the audience. I guess about 150 people. 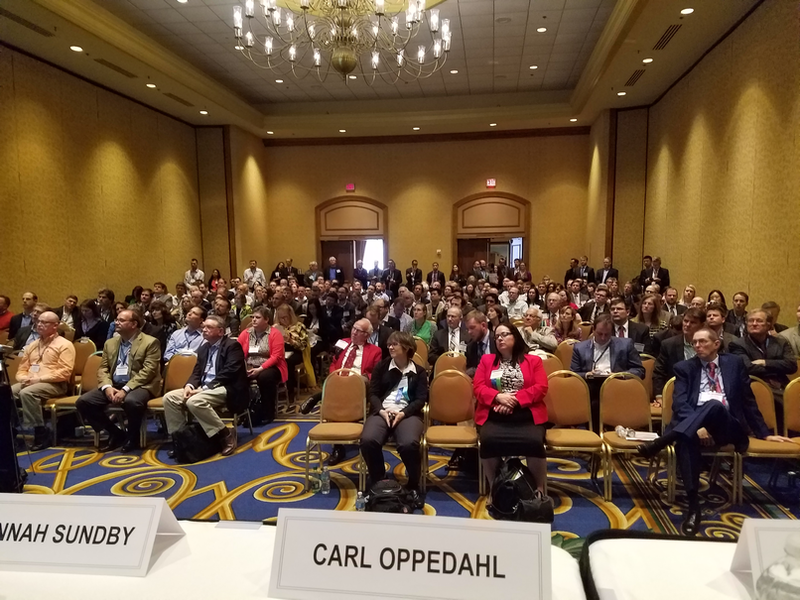 Also on the dais were Robert Sachs, talking about Section 101 and Alice, and Suzannah Sundby, talking about Section 101 in the biotech/pharma world. You can download my slides here. From a glance at this graph, one might have the impression that the problem at the USPTO had started in October of 2015. 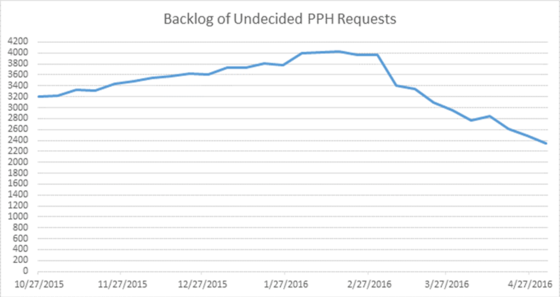 In fact the problem dated from at least as early as November 2014, when I blogged about ever-increasing delays at the USPTO in granting PPH requests. In April of 2015 I had faxed a letter to Director Lee about this growing backlog. Will you be in Orlando, Florida at the time of the 2016 meeting of INTA (the International T rademark Association)? Are you a member of the E-Trademarks Listserv? Are you with a trademark or patent firm located outside of the US? Or are you with a corporation? If so, we hope you will join the people of Oppedahl Patent Law Firm LLC at our reception for the E-Trademarks Listserv. Our reception will take place at B B King’s Blues Club from 5PM to 8PM on Tuesday, May 24. To learn more abut the reception, and to RSVP, please click here.